One of my goals for this year was to spend more time on my hobbies, which include blogging and crafting. As you can see, I’ve been fairly active in the blogging department. I’ve also spent quite some time crafting. Last week, the idea of taking on new crafty challnges set out in my mind. While I stuck with cardmaking, I did try a new technique and finally got to use the orca brads that have been lying in my stash forever. I hope this is indeed the right image as I keep forgetting to give my cards descriptive file names. 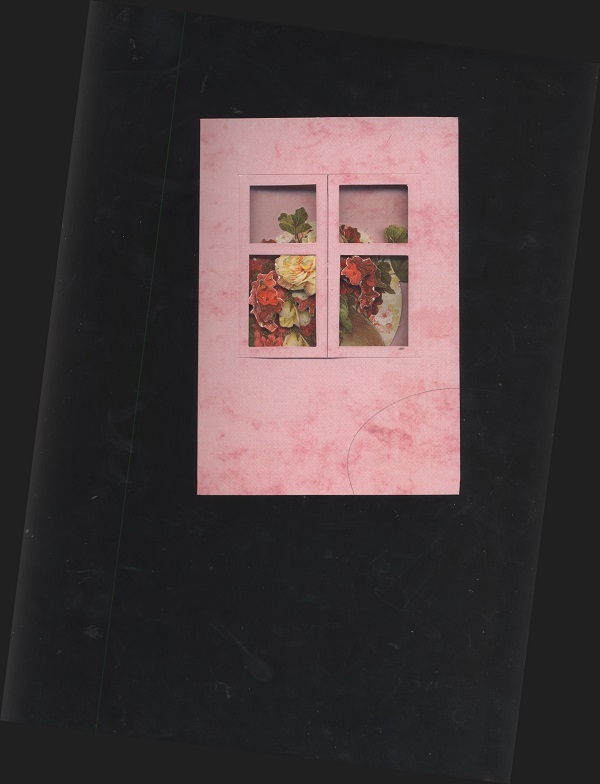 The card base is off white and 10×10 cm (around 4×4 inch). I got it from a cardstock pack I found at the local supermarket a while back. On top is a layer of blue cardstock thaat’s 8×8 cm and came from the same pack. The top layer is stuck on the base with 3D foam squares, so it is a bit raised. I stuck the brads into the top layer, which was really hard and with which I needed tsome help. I don’t know what color the brads are. In the four corners of the base are blue pearls. Then this week the activity staff who came around on Monday brought some die-cut images. I had never worked with die-cut images except when someone sent me readymade ones, but I was excited to try them out. They are to be punched out, which I did on my own. I got help positioning the parts of the image correctly. The card I used was readymade. I am really looking forward to going to the store these images were bought at so that I can buy some myself someday. Lately I’ve been enjoying polymer clay and particularly have been making beads out of it. 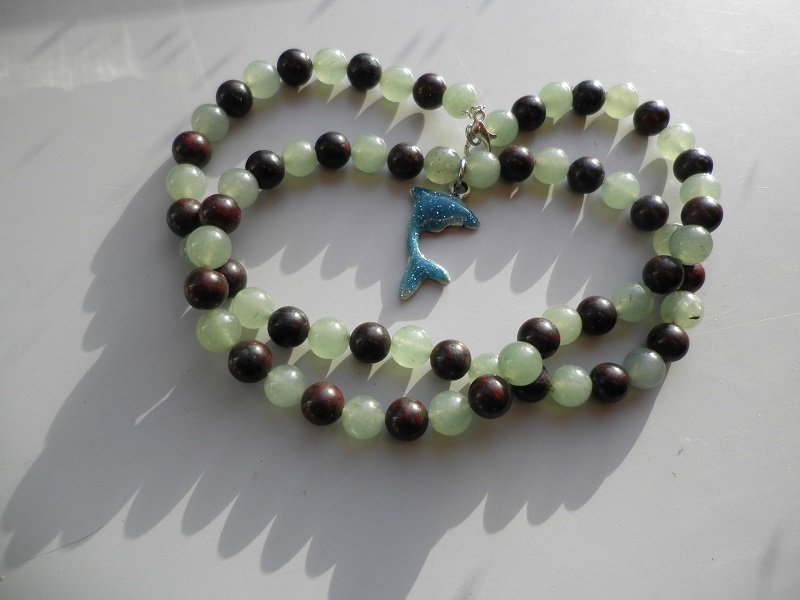 I also have bought a number of jewelry-making supplies, such as gemstone and glass beads, charms and wire. Here are my first two bracelets. This one my husband nicknaemd the Ado The Hague bracelet after a Dutch football club. 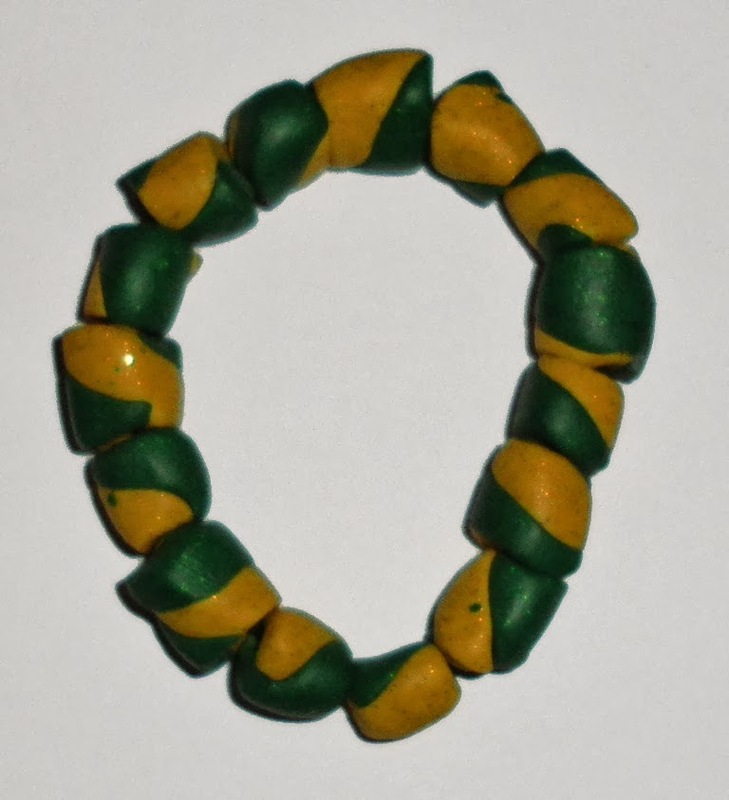 I think the football club’s colors are yellow and green, while the bracelet truly has golden glitters in it, but I’m not sure that it shows on the picture. I used green and golden glitter Fimo Effect and rolled two rolls into what I believe to be a jelly roll. 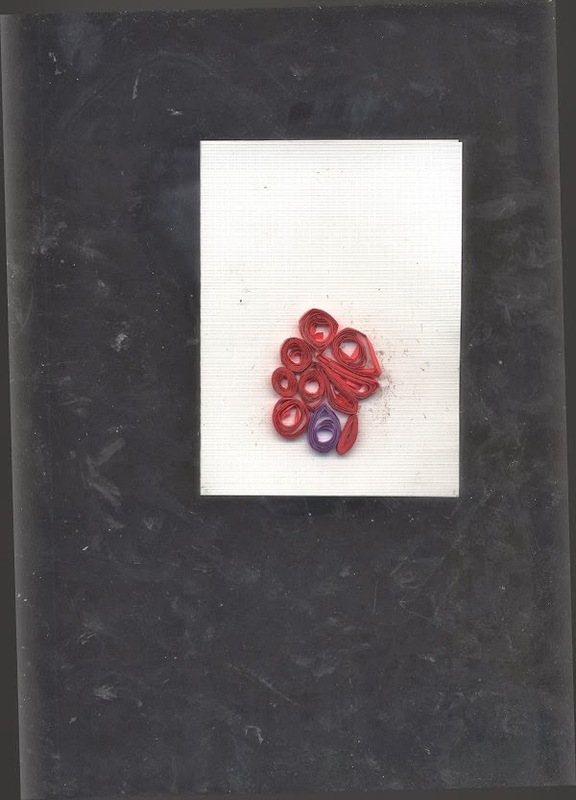 Then I cut beads out of that, then had them lie around forever after baking before I strung them together on elastic wire. I am soon going to make a similar one in different colors for a nurse here. 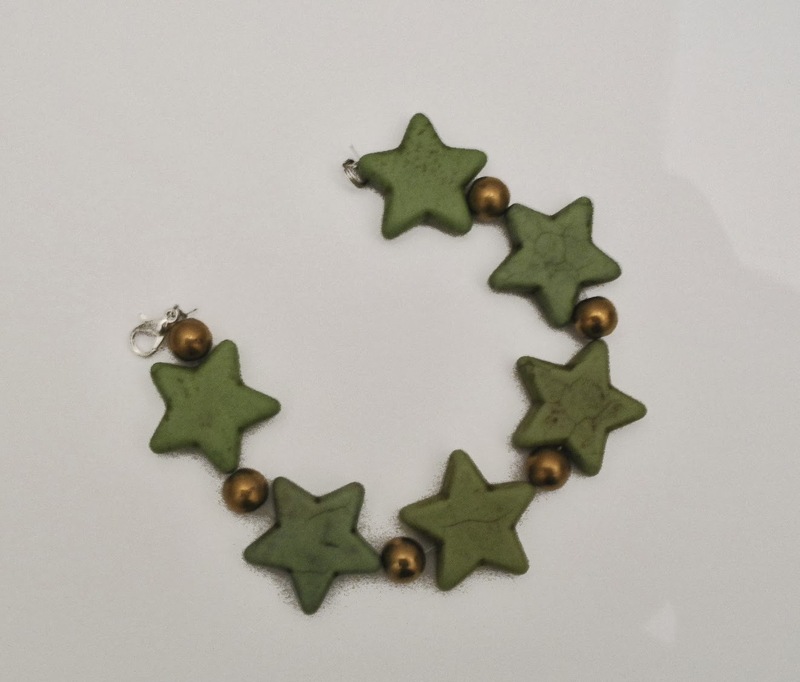 This one got nicknamed the Christmass bracelet for its green stars. They are made out of turquoise I believe. The golden beads are glass beads. I strung these onto a metal wire and attached the clasp. I got some help with that bit, but must say I can do it mostly independently now. I am extremely tired due to a combination of a lengthy eye doctor visit – it consisted mostly of waiting -, physical pain, and overload due to a very hectic fire drill. I might write about the eye doc visit tomorrow or some other time, or I might not, but right now I just have time for a quickie. As promised, therefore, here is my colored sand card. 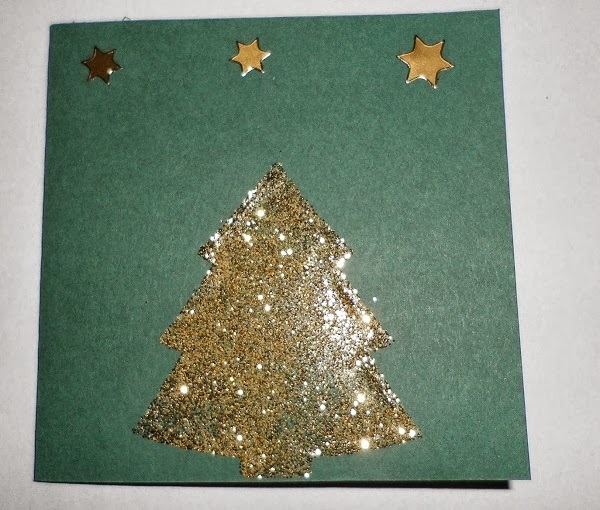 It is a simple Christmas tree, which I cut out of double-sided sticky foil using the smaller one of the lovely Marianne Design dies. I used gold-colored Sandy Art sand. The stars that fly over the Christmas tree are from my stash. 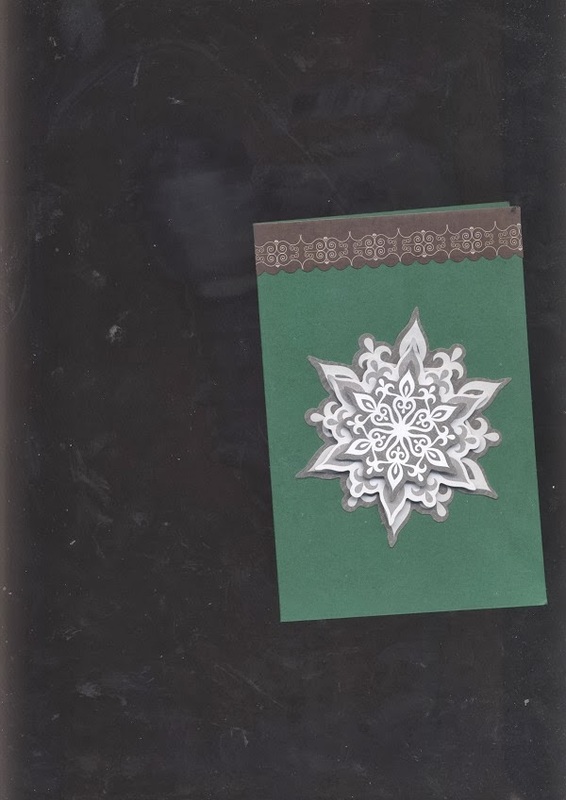 The green cardstock base comes from a pack I bought at the supermarket for much less than it’d cost at the craft store. I used to have a crafting blog that I posted regularly to. 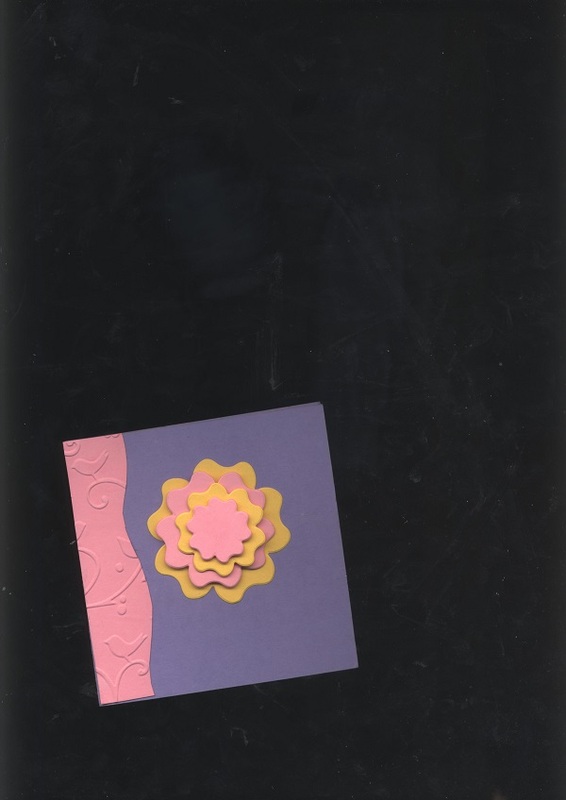 However, as time progressed and my cardmaking did not, I lost interest in posting pretty simple, childish-looking cards. I still made at least one per week for a Christmas card challenge, but only so that I wouldn’t be kicked out of the group that ran it. Since I moved to my current institution in June, also, my individual art therapy sotpped, and the group I attend is pretty demanding of independence. I want to transfer to a less demanding group, but have not yet been able to speak to my named nurse on this. I’ve been looking for crafts that didn’t require sight, and on a Facebook group for crafters with chronic illness, someone mentioned quilling. So I bought a quilling starter kit a few weeks ago and have been playing with it. 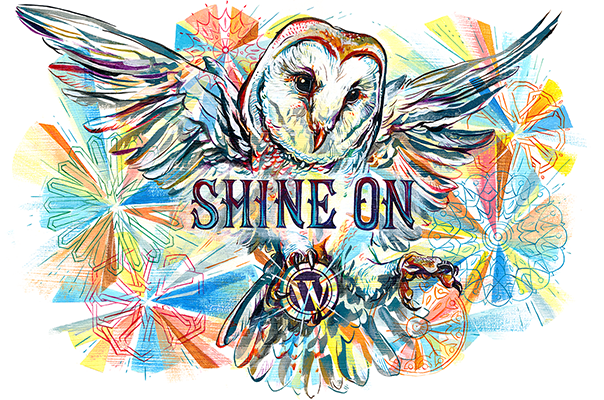 First, I designed – or rather, didn’t design – a random pattern. I didn’t take note of or get feedback on the colors or shapes. I decided not to finish the random pattern because it really felt like a waste of paper. 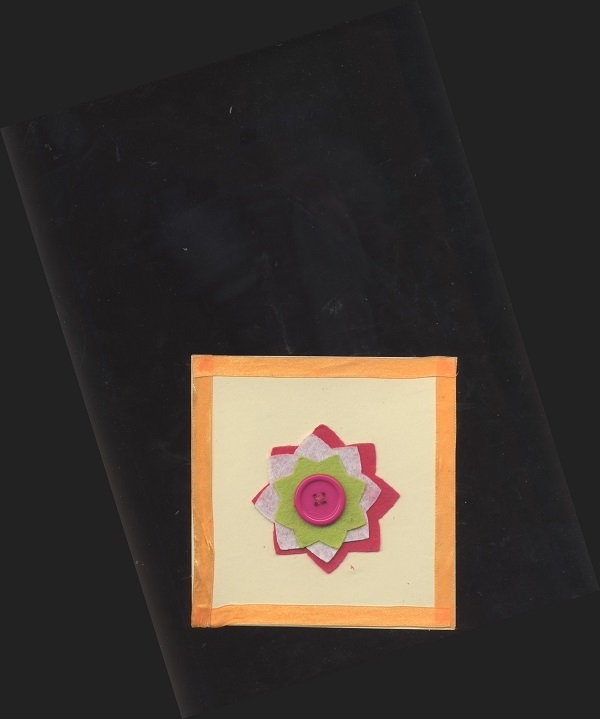 Last Tuesday, it popped into my mind to make an actual design, and the simplest would be to make a card border. 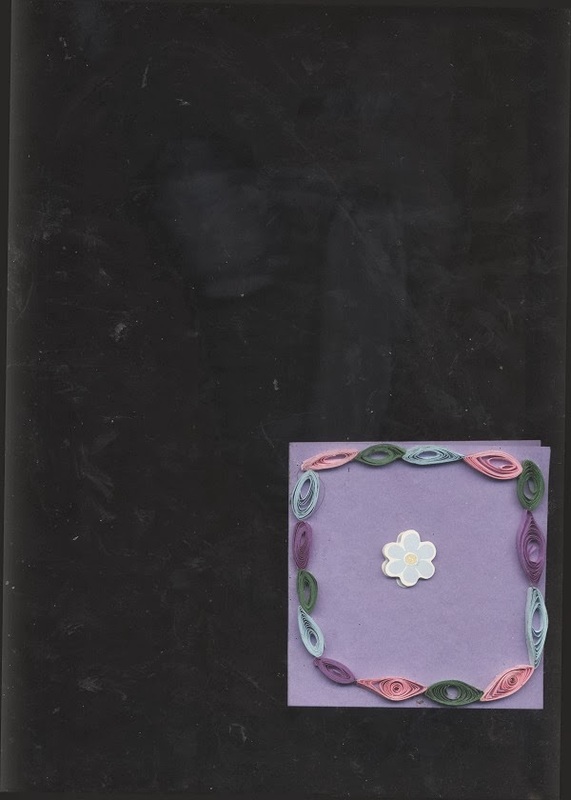 I used purple, pink, green and blue quilling paper. I only found out as I was finishing the project yesterday how to make the holes in the coils smaller. I use the needle tool because I can’t manage to put the paper into the slot of the slotted tool. 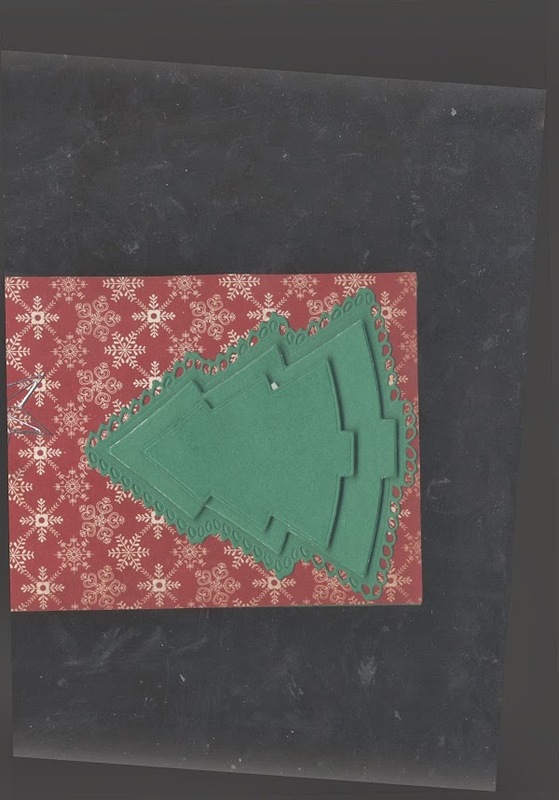 I’m not sure how to make the holes as small as they are on the few ovals that one of my staff made using the slotted tool, but overall, I’m quite content with this card. 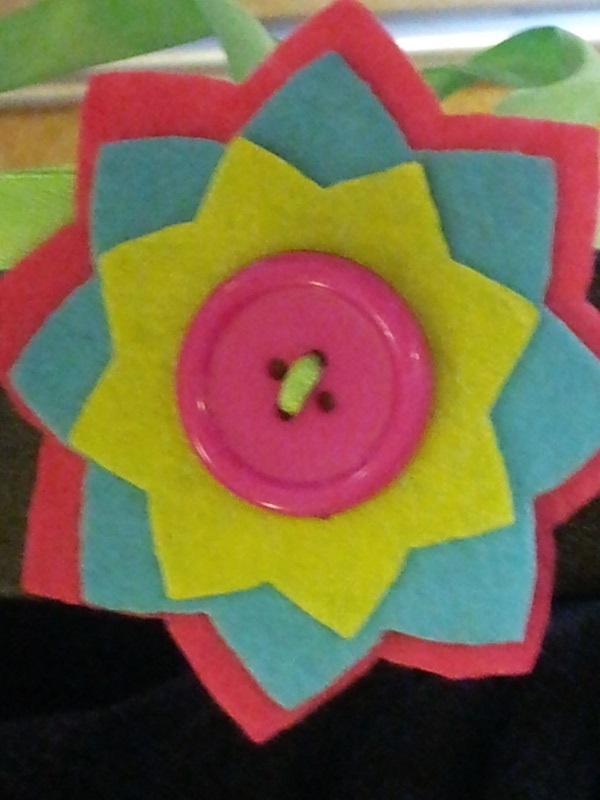 The cardstock and the center flower are from my stash. 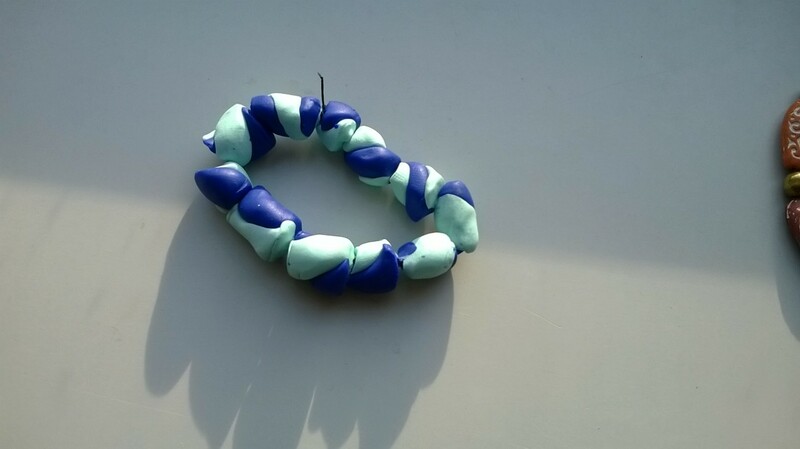 I have been trying out a few other crafts, like polymer clay, with which I made a number of jelly roll beads. I have not yet been able to make them into a bracelet or necklace, because some essential jewelry-making supplies have not yet arrived. 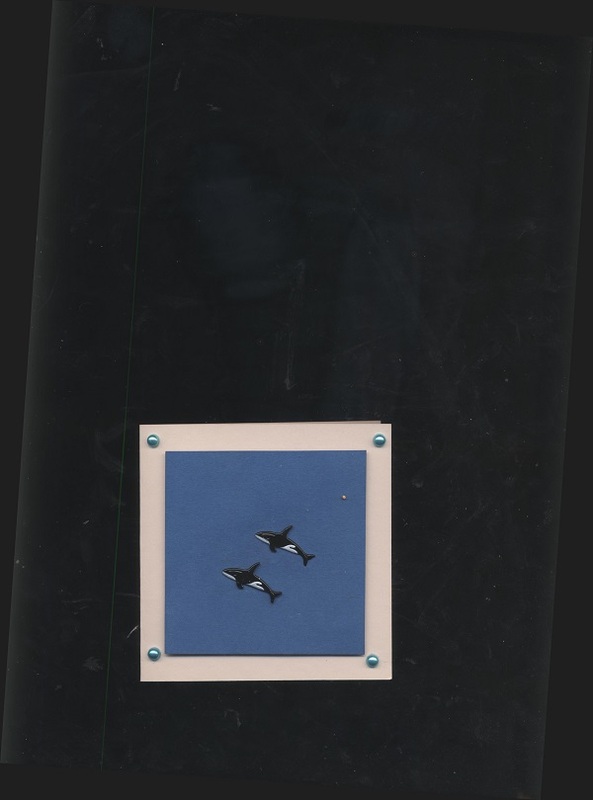 I also just today made a card using colored sand, but I’ll have to wait to show that one till my husband can take a pic, because I don’t want to damage the surface of my scanner with the sand.